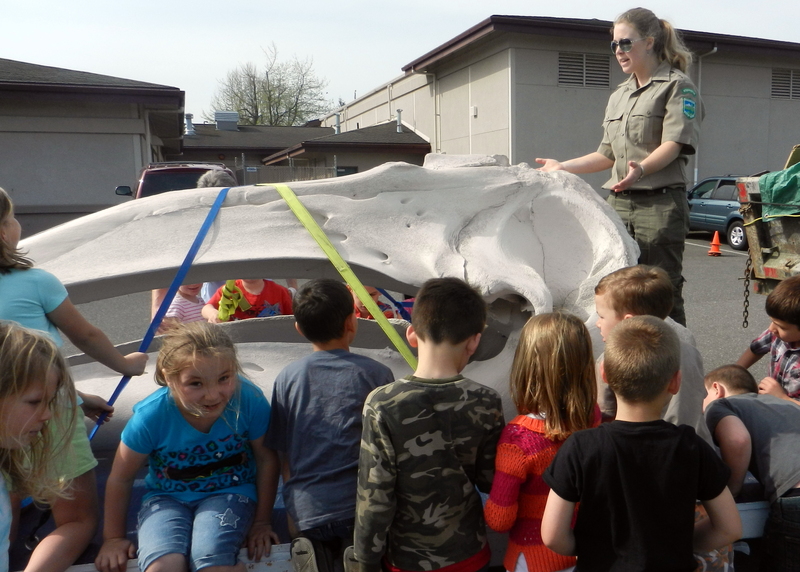 AmeriCorps Intern Jessy Osterloh engaging schoolchildren with Gracie, the Gray Whale Skull in a program for local schools. In 2010, the park’s Interpretive Specialist was lost due to State Parks budget cuts. This left the park without any staff dedicated to educational work. The Foundation believes that interpretation and environmental education are among the most important functions of any park. Hundreds of school children visit Deception Pass (and especially the Rosario Beach Tide Pools) on field trips each year, and the park’s annual visitation rate is nearly two million. Education and interpretation allow the natural and cultural wonders of this unique and special place to be shared with park visitors. In order to ensure that these activities continue at Deception Pass, the Foundation hired an Interpretive Intern for the summer of 2011. In the fall of 2011, the Foundation provided matching funds to the Washington Service Corps to bring in an AmeriCorps member to perform interpretive duties at the park for the next 10 and a half months. This position has been renewed every since then. While exciting, these are only temporary solutions. A successful and effective interpretive program requires continuity and a team of dedicated staff. The Foundation would like to build a sustainable and robust interpretive program at Deception Pass, but we need your help to make it happen.